After our social media followers get the first word, we post a wrap-up here at the site and archive them here. 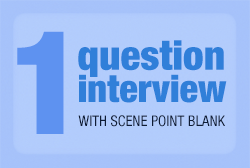 This week check out Q&As with Spotlights, CoinTossRecords and Thin Lips. SPB: What’s the strangest trend you see in modern music (or in the industry)? Sarah: The strangest trend I have been noticing today in music is seeing older bands (that I grew up listening to), like Failure, Shiner, and Hum, get back together and be reviewed and/or accepted into the “metal” scene. Growing up these bands were, to my recollection, considered more Rock or Alternative. I think it’s awesome and I love that they are getting that recognition, because they are heavy as F. I also think that the “industry” today is a lot more accepting now that the lines have been dissolving that were created by the big dinosaurs that used to run it. Weird? Yes. Awesome? Definitely!! Heavy music has a bright future and it’s exciting! SPB: What was the first punk show you attended? Chrissy: I definitely am always scared before we play...Sometimes it's worse than others. The boys are pretty relaxed, a little nervous here or there, sometimes pretty nervous but it doesn't show too much. Usually once I start playing I'm fine but right before I get on stage I range anywhere from pretty nervous to extremely terrified. It still seems worth it every time though.